This was my second time running the St Leo’s Roadraces and my first time repeating a race (not counting back to back times I walked the Autism Ribbon Run in Raleigh). I knew what to expect this time, and knew to temper my expectations based on my performance and injuries of late. I just wanted to finish this without issues and make it through. They made a change to the race this year that I wasn’t totally thrilled about, they started the 10K a full 45 minutes after the 5K (even when it was only 10 minutes after I’ve always contended they should start the 10K first) under the idea that people could run both the 5K and 10K, and as far as I know only 2 or 3 people did it, so was it really worth it? The back of the pack 5K finishers were still coming in when it was time to start the 10K so that delayed the 10K start for a few minutes while they set out cones to funnel the 5K people into the finish while we were getting started, so it was really an impediment to both groups. Also, the guys who finished 1st and 2nd in the 5K also finished first and second in the 10K, which kudos to them, but is that really fair to the other runners? Not that I will EVER sniff first overall, but the guy who was 3rd in the 10K could have been first if those other two were dueling it out for the 5K win and not in the 10K. The race started out pretty crowded, which was fine with me since I was committed to take it slow and easy. I wasn’t 100% sure how my knee was going to handle this and hurting my quad on Tuesday was just another complication. At least the long wait for the start gave me plenty of time to stretch out and do some warm up jogging. The group thinned out pretty quickly as we move out onto the course and the faster guys took off. I stayed with the same people most of the time and there was one guy who was with me pretty much step for step. He was doing run walk intervals and it seemed like he would get right up beside me and his watch would beep to walk and then he would drift back as I kept going with my slow pace and then he would catch up to me again and then walk and so on and so forth. He ended up finishing a couple seconds before me as either he was on a run interval or he was dashing to the finish and ignoring the intervals. The weather was gorgeous, you couldn’t have asked for better. High 40’s to wake up to, mid-50’s by race start. It was a little bit chilly at the start, but warm enough for shorts and short sleeves and warmed up a lot by the time the race was over, but not hot. (Last year was ROASTING). Worked up a good sweat but didn’t feel like I was going to die. Perfect. 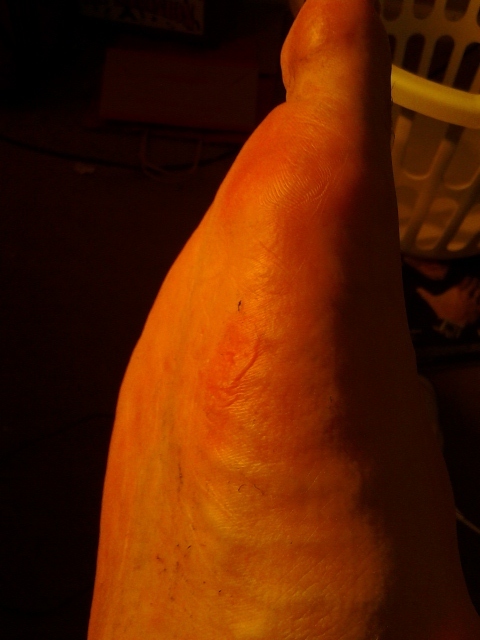 The whole time I kept monitoring my knee and was constantly surprised when it felt just fine. I tried not to think about what “could” happen later in the race, and just keep going and deal with that if and when it happened. Around mile 4.5 I started getting a sharp pain in my right foot but it wasn’t muscular so I wasn’t sure what it was. To be honest, I thought I had a rock in my shoe and debated on whether I should stop and dig it out. It was annoying but not excruciating so I decided to keep going. When I got to the finish I found a place to sit down and when I took my shoe I discovered it was not a rock but rather a pretty nasty blister. I’m not sure what caused that since I’ve never gotten a blister from running before. It was pretty gnarly though. I have to say though, if that’s my only “injury” I’ll take that all day long. I didn’t have any kind of time or pace goal for this race, really only wanting to “finish”, or as I thought might be the case to “survive”. I ended up with a faster pace than I anticipated and felt good doing it so that’s always great. I finished in 1:13:20 for an overall pace of 11:44 per mile and splits of 12:14, 11:51, 11:37, 11:42, 11:44 and 11:37 plus 0.25 miles at 10:40 pace to the finish. That’s not a PR, but it’s not far off (Rural Hall 10K – 1:08:29). I’m very pleased with this result! And I’m also very very glad that I didn’t get hurt again. That would have been very discouraging. This state of constant injury since about December is really wearing on me. It just seems like it’s one thing after another. Highlight of the Race: Early on, a little boy, about three years old, gave me a high five so hard it stung my hand. He swung at the shoulders and put his whole body into it. That how ya do it! Next race will probably be the Susan Komen 5K in May. I’m publishing my Year in Review a couple days early this year since I’m going to be busy this weekend through New Years and may not get a chance to publish before then. 2012 was an amazing year as I grabbed the bull by the horns with both my running and my weight loss and made some dramatic changes in my life. It will be a year I won’t soon forget. 2012 was certainly the year of the race. This year I completed 15 races including 6 5Ks (3.1 miles), 1 trail 5K, 2 8Ks (5 miles), 3 10Ks (6.2 miles) and my first 3 half marathons (13.1 miles). If you want to check out the recaps of these races with pictures you can click the Races tab at the top of the page which will take you to the race recap page. Here’s the list in Chronological order of what I accomplished this year on the race circuit. All this came on the heels of only running one race (a 5K) in 2011. The race bug bit me and bit me hard. Along with all these races was a whole lot of training mileage. I logged about 100 miles of training for each of my three half marathons, as well as maintenance mileage to just keep me going. Keeping a new race on the horizon, even a short one like a 5K, made sure that I could not stop what I was doing and to push me onward. I set a goal for myself this year of 732 miles (2 miles per day X 366 days). I’m not going to reach that, my injury riddled December knocking my mileage down to almost zero, but I’m going to get pretty damn close. Depending on what kind of mileage I get this weekend, I should hit somewhere between 690-700 miles. This is an astonishing increase after only logging 115 miles in 2011 (Granted, it was only from Aug-Dec). I don’t know what my goal for 2013 will be, probably not a number/mile goal. Maybe a race goal. 3 more Half Marathons. More than 3? We’ll have to see. Of course the purpose of all this running was to lose weight. Although, I got to the point where I enjoyed it and it was no longer a chore. I also had to adjust my eating habits, which I began in the later part of 2011 when I joined MyFitnessPal in October. On Jan 6, 2012, my first weigh-in of the new year, I weighed 282.2 pounds. This matched the weight I had achieved before joining MFP and before gaining back 20 pounds to 302. This, at that time, was my lowest adult weight. I had been over 300 pounds dating all the way back to High School. This past Sunday (Dec 23rd) I weighed in at 237.4 pounds. That’s a loss (for the year) of 44.8 pounds. That’s an average of 0.86 pounds a week. This is much less than the “2 pounds a week” MFP proclaims you can lose using their calorie counting system, but it’s also nothing to sneeze at. From my highest weight of 355 pounds in the fall/winter of 2009, I have lost a mind boggling 118 pounds. This continues to astonish me. Along with running I’ve picked up a few other fitness related items based on the availability at the YMCA of which I am a member. I started practicing Yoga in December of last year at the insistence of several of my running friends (notably, all female) who swore by it for the stretching which is vital for preventing injuries. I’ve now been practicing for a year, and I’ve noticed huge differences in my flexability, but Yoga has also been an amazing stress release and taught me to control my thoughts, control my breath and calm myself when things get crazy. The deep breathing exercises (similar to the ones we used to do in marching band) has also greatly increased my lung capacity and endurance. I barely breath heavy at all when I run anymore, much less the frantic huffing and puffing I used to do when I first started. If Yoga exposed a weakness, so to speak, it was a lack of upper body strength. I struggled with what are supposed to be some of the easier poses like Downward Facing Dog, and Plank. I don’t remember exactly when I started, but I began a once a week, light weight lifting routine using the weight machines at the Y. I’ve noticed a marked change in my arms, shoulders, neck and chest. I’ve also noticed recently, that while it did take a while to see a result, I now can hold poses like Down Dog longer than I used to be able to, so definite progress there! One of my friends from Yoga class nagged me for a while (in a good way) and convinced me to finally come to a spin class with her. I had done spinning once at my old Y and absolutely hated it, and was hesitant to try it again. I finally gave in and started it around April, after my first half marathon training was complete and I had time for some cross-training. The spin class at my new Y is the Les Miles RPM class which uses an enthusiastic instructor and loud music to rev you up and give you a “beat” to follow. I fell in love right away, and even though the class completely whipped me, I loved every minute of it and have continued to come back for more “punishment” weekly. After getting over the nervousness of group exercise classes and embracing the social aspect of gym life, as well as the social aspect of fitness websites DailyMile and MyFitnessPal, I’ve been able to break out of my shell and become much more social than I’ve ever been in my life, including joining the local running club, the Twin City Track Club. A large part of this shift is also the increased confidence in myself from losing weight and becoming more physically (and mentally) fit. Big shout out to my old friends Tim and Amanda (who got me into running and got me on MFP), and to my new friends Jen (my first running buddy), Cathy (who dragged me from Yoga to spin), Heather (who cheered me on in New Orleans), The running family of Landis’s Kathi, Brian, Briana and Caramia (who are always open for dinner and a run anytime I’m in Kannapolis), Lisa (who shares my love of running and all things Disney) Rob, Robert, Jill, Emily, Steve, Carmen, Lesha, Hernan and everyone else in the Twin City Track Club. And thank you to all you out there who read my blog, whether I know you or not, have met you or not, you keep me going with your encouragement! I was hesitant to mention this on the blog, but it is relevant. Some of you who have read my blog for a while know I was married, with several references to my wife, her family and particularly the painful death of my father-in-law that marred my 2010 year in review. My wife and I are no longer together having separated in September of 2011 and after the required one year waiting period our divorce was finalized in November of this year. I mention this for two reasons… the first is that her leaving me (she literally walked out, came home from work one day and she was gone, despite the fact that I knew she was leaving, it was still sudden) was the spark that started this whole snowball rolling. I realized after years of trying to help and “fix” other people I had neglected myself to the point of serious unhealthiness. I decided to take care of ME before I started worrying about others. I joined MFP, took up my running again which had fallen by the wayside, and started this journey to where I am now. I’m not ashamed to say that a little bit of “How do you like me now?” is the flame that burns for my motivation to keep going. The second reason is that for those of you who did know I was married, or thought perhaps I still was, I didn’t want there to be any confusion or scandal when in the next couple of days I introduce you all to my new girlfriend. She’s coming to visit me and run a race with me on New Years (same midnight race as last year) so I’m sure she will be making her blog debut shortly. 2013 looks to get started the same was 2012 did with the midnight New Years race, so hopefully that will be a sign of good things to come as I follow on the heels of this amazing 2012. I still have some work to do, and a little bit of weight still to lose. I’m also going to be running my 4th Half Marathon, in Disney in January which I’m very excited. 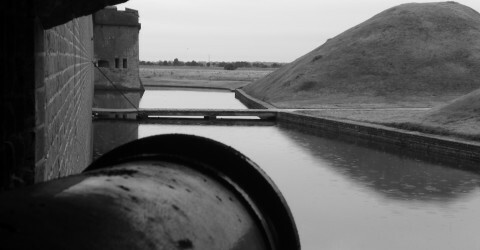 There’s also another fairly exciting adventure in the works for 2013 but you’ll just have to stay tuned for that. As I’m wrapping up a 2012 year that will have seen 15 finish lines by the time it’s all said and done, including my first half marathon (with 2nd and 3rd the last two races of this year) and at least one race for each month of the year, I told myself I would take it a little easier for 2013, but man, the dance card just fills up so fast. Here’s a look at the possible lineup for the first 4 months of 2013. The two January races are registered for and booked, the rest are tentative. Jan 1 2013 – Running of the Lights 5.5K – Once again, we get the year “off and running” with the midnight run through the Tanglewood Christmas lights. Hopefully several of my running friends from last year will be returning as well. Jan 12 2013 – Walt Disney World Half Marathon – Can’t wait for this run. A nice leisurely 13 mile jaunt through the house the Mouse built. Everything I’ve read points at this being an awesome race. My whole family will be there as the race weekend becomes a mini-vacation for us all, and last but not least, this race will be my 3rd half in less than 90 days to qualify me for the Half Fanatics. Feb ?? 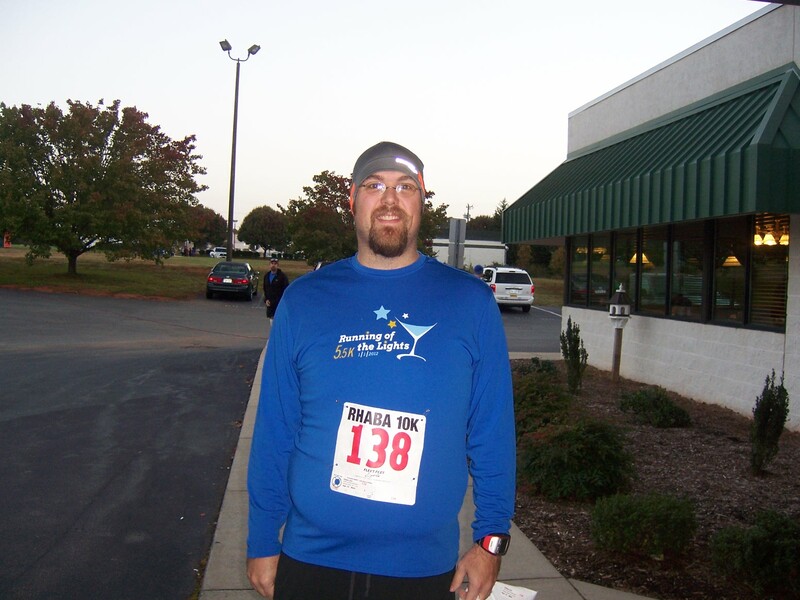 2013 – Fitness, Friendship and Fun 5K -Kannapolis NC – Don’t know the exact date for this race yet, but I gotta go back and help out my running friends the Landis family, and defend my 2nd in Age Group from last year (maybe go for first?) The JP Runner Girls is a running group for elementary school aged girls, similar to Girls on the Run, but local to Jackson Park Elementary. 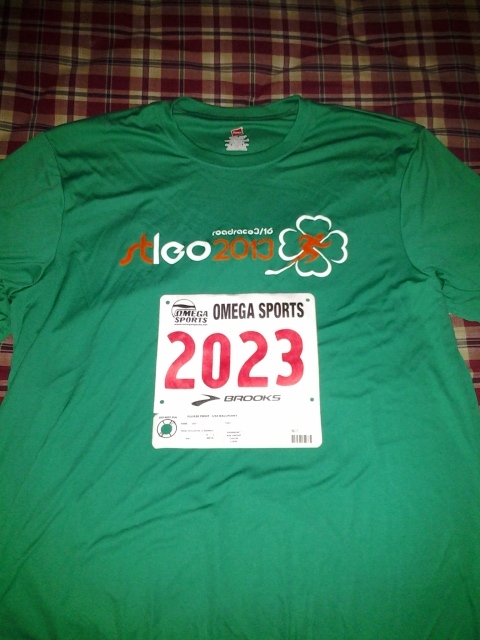 March 16th 2013 – St Leo’s 10K – Winston Salem NC – I’m looking forward to tackling this course again, it’s a very very tough course. My work friend Carmen will be running the 5K and maybe Jennifer will join me again for the 10K, we shall see. Also the spaghetti and beer dinner the night before is a MUST! April 20 2013 – Tar Heel 10-Miler – Chapel Hill NC – I was bouncing around several spring races including the Flying Pirate Half Marathon out on the Outer Banks, but finally settled on the TH 10M for several reasons, my sister and her boyfriend (who ran it last year) are moving back to Chapel Hill and will be living there by this time, the race runs through UNC Chapel Hill’s campus, which of course is the rival of my Alma Mater NC State, but they have a very cool “crash the party” option where you register under another school in the ACC and the top three get custom bibs (Last years top three were Duke, NC State and Wake Forest, so I’d say it’s a safe bet for the custom bib) so to run through UNC’s campus, with a Wolfpack bib and rep NC State while I’m there? Heck Yes! Sign me up. April 27 2013 – Kings Mountain Half Marathon – Clover SC – I just found this race very recently, but it quickly became a must run. The fact that it falls the weekend after TH10M is serendipitous since the weekend before a half I’d be running 10 miles anyway. The race takes place entirely on the Kings Mountain Rev War Battlefield park in Northwest SC, right outside of Charlotte. It’s a very small event (less than 200 runners for Full and Half combined last year), with a local friendly feel, and the registration is only 35$. Half marathon race, and half marathon perks (shirt, medal, counts for Half Fanatics) for the price of a 5K? Sounds great! It may not be the Chickamauga Half Marathon, but it should still have cannons! Changed things up a little bit this week. I had a hard time finishing my spinning routine last Monday after a 8 mile run, so I knew not to try it after a 9 mile run, so Monday has become a rest day. Had a 10K on Saturday which was originally planned to be a half marathon tune up, but I decided I wanted to set a new PR, and I did, by over 7 minutes. This was probably a good idea (rather than running the 10K at 12:30 “half marathon” pace and not setting a PR) since it really pumped my up and listed my spirits. The last several weeks of 20+ miles has been taking a toll, but Saturday was a HUGE boost. Very happy to see a loss this week, not that I thought I would gain, since I didn’t have any big dinners or anything like that. I know I wrote in my race recap about the 10K, but I’m so pleased with my performance, not only setting a PR, but feeling like I had more in the tank at the end, I could have kept going if I needed to. This is such a huge confidence booster getting ready for the half marathon. The double runs (Sat and Sun) has paid huge dividends as well as the long runs. Logging 13,14,15 miles per weekend has been a huge boost to me. My training plan for this Raleigh half marathon has been aggressive because it needed to be, but it’s working! I believe I had this race on my schedule before I decided to run Raleigh, but when I realized it was two weeks before the half I decided I would treat is as a half marathon warm up. 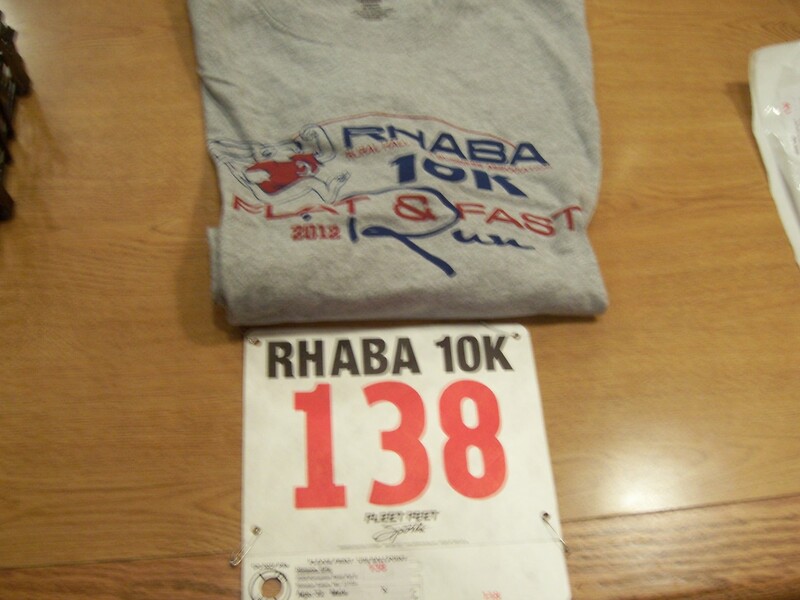 I was going to run this race at my projected half marathon pace, which is slower than my 10K PR pace. Well, the last few weeks as my pace has improved, and I’ve become less and less worried about my finish time in Raleigh, I knew I could have a chance to set a nice PR at this race, so that’s what I set out to do. I’ve been running some fairly quick tempo runs on Saturday’s and they haven’t seemed to have any ill effect on my Sunday long runs, so I knew if I pushed for a PR I wasn’t going to risk doing any serious harm to my half marathon training, this basically became a 6 mile tempo run. T-shirt rather than a tech shirt, but it’s nice and it fits. Add another single XL to the collection, which I don’t have very many so that’s a good thing! This is an interesting course, beginning and ending at the Mayflower Restaurant in Rural Hall, just off Hwy 52. It starts off with two loops through a couple neighborhoods, which this section was anything BUT flat, both up and down. Mile 2 started with a steep downhill, which I actually let myself accelerate down it rather than hold back, which was fun, and nice to see I still had control. Mile two finished with a pretty nice climb, and then mile 3 had a BIG climb. 138 feet of ascent for mile 3 was about 3 times any of the other miles which were all around 40-50. After that, we hit out on Hwy 65 down to the Rural Hall City Hall, which was the 4 mile point for a turn around, and then took 65 all the way back to the finish, we did not loop through the neighborhoods again on the way back. Happy pre-race photo (not that I was un-happy after the race). I cannot get a bib on straight to save my life. I’m pretty happy with my pacing for this race, but I still have a little work to do before the half, although I’m almost to the point now where I get what I get and I have to just be happy with it (but I’m worried about going to fast, and wearing myself out, not too slow). The first mile felt good, although I knew it was too fast (10:25), miles 2-5 were up and down timewise (11:11, 11:34, 11:01, 11:06), but it seemed like every time I looked at my watch I was holding steady at an 11:03 pace, so I was pretty happy with that. Mile 6 sped up a little bit as we came in for the finish (10:59, which was also my total average pace, I swear that happens EVERY race), and then I turned the corner and kicked in the afterburners to the finish line running the last 0.23 miles at a 9:35 pace. My finishing time of 1:08:29 is a good 7 minutes faster than my previous 10K PR (1:15:34) and actually, the pace is faster than my 8K PR from September (58:50, 11:45 pace). Starting and finishing in a parking lot was nice since it gave everyone plenty of room to walk around and stretch and I did something I normally don’t do (but should) and jogged two warmup laps around the restaurant. I also made sure I kept walking after the finish as a cooldown which is something I also forget to do most times. I need to remember this for Raleigh. I posted my time in the Runner’s World training calculator I mentioned a while back and now it says my half marathon time should be 2:30 (11:45 pace). I’m not sure if I can hit that, but I may start with that pace group and see how it goes. I was originally shooting for a 2:45 finish, but I don’t know if I want to start with the 2:45 pace group since I’d like to run the first couple of miles faster than 13:00 pace (without killing myself too early). I can’t believe I’m changing my goal for the Raleigh half marathon two weeks before race day and adjusting it FASTER and not slower…. Yikes! 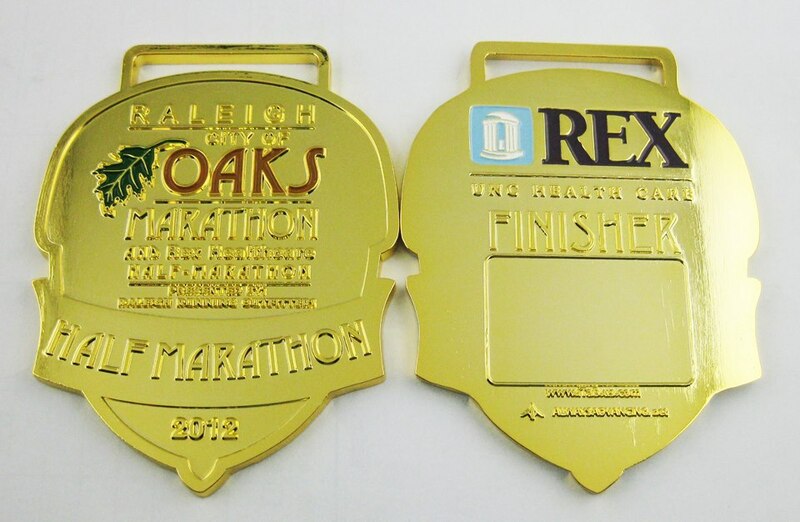 (medal photo posted on the Raleigh City of Oaks Marathon Facebook page). Today marks the one year anniversary of when I joined the MyFitnessPal website. First off, man has it flown by… I can’t believe it. And what a year it’s been. Here’s a look at what I have accomplished in the last 366 days (leap year ya know). First and foremost, the reason I joined MFP was to help me lose weight. Counting calories can be a chore, but it really helps you stay accountable. Even only after a few days, I would look at the 400 calorie Mr Goodbar on the grocery store shelf, think about what a percentage of my daily total that was and then put it back. To date, I’ve lost 66 pounds from 308 where I started down to my current weight of 242. My total loss from my heaviest weight of 355 is now 113 pounds. Sometimes the scale doesn’t show what you would like (such as the three months in the summer I lost a total of about 3 pounds), but there are other ways to measure success. I didn’t start taking measurements of myself until January, but in those 10 months I’ve lost 4 inches around my chest (49 to 45), seven inches around my belly (52 to 45), and 2 inches at my hips (waist of my pants) from 43 to 41. I’ve gone from a 2XL shirt, to a XL and even some Large’s that fit. I’ve gone from a 44 size pant to a 40 with a belt. My 40’s are falling off me without the belt and the next pants I buy will be a 38. This is astonishing since I’ve been wearing size “4’s” (40, 42, 44, 46) for… well.. as far back as I can remember. From October of last year to October of this year I have run a total of 628 miles. This works out to 1.71 miles per day. As part of my running, I’ve completed several races of varying distances. Since November of last year I have completed 8 5K’s (3.1 miles) and reduced my time from 44:12 (Nov 2011) to 34:02 (May 2012). I have completed two 8K’s (5 miles) reducing my time from 1:02:55 (Feb 2012) to 58:50 (Sep 2012). I have completed two 10K’s (6.2 miles) reducing my time from 1:38:10 (Mar 2012) to 1:15:34 (May 2012). I will complete my 3rd 10K this upcoming weekend and hope to reduce my time further and set a new PR. I have completed one half marathon (13.1 miles) with a finish time of 3:11:18 in March of 2012. I have three more half marathon’s lined up in the next few months, with Raleigh (Rex Healthcare) in November, Mistletoe (Winston Salem) in December, and Walt Disney World in January. The Raleigh half marathon has a 3 hour time limit and so I have been training hard to reduce my time to under that limit. Mistletoe and Disney will not be run for time, just to finish. I’ve met some wonderful people on MFP who support me and I can support in return, the community aspect of the website is fantastic and it really really works. I wouldn’t trade it for anything. What a year! And lots in store for the next year as well! If your a statistics geek and like to crunch numbers in excel spreadsheets than this will be the post for you. I mentioned this in my weekly recap, but I wanted to get a little more in depth with the numbers, since I am the aforementioned statistics geek. On my Saturday run last week with Rob he mentioned a training calculator on the Runner’s World website (found HERE). You input your finishing time for your last race at any distance and it will calculate for you a projected finish time for most of the standard race lengths (and a few odd ball ones). I plugged in my finish time of 58:50 from my 8K two weeks ago and this is what it gave me. These are some interesting numbers, the formula uses a fraction of the race distances to increase the time and then a static multiplier (1.06) to account for slower pace at a longer distance. The shorter distance numbers are interesting, the one mile at 10:41 is pretty quick, and while my fastest mile is 10:08 my “usual” mile is not anywhere close to that. 35:32 is a pretty good 5K time, although my PR is 34:02, I was 35:10 at the Beat the Heat which was my last road 5K. The trail 5K was a whole different animal. The 10K time of 1:14:10 would be a new PR (current 1:15:34) so that’s encouraging and gives me something to shoot for at Rural Hall in October. Just over 2 hours for 10 miles is an interesting target as well, gives me something to shoot for at the Tar Heel 10-miler. Of course the half marathon and marathon numbers are what jump out at me the most since that’s what I was trying to predict. 2:43 for a half is a 12:45 pace, which shows the “slow down” with distance, since the 8K time I put in was just sub-12 (something like 11:57). But 2:43 will certainly get the job done in Raleigh and bring me home in less than 3 hours and blast my New Orleans PR time by a good 30 minutes. The marathon time is also interesting, because besides obviously not being trained for it, I’ve shied away from the marathon distance because I didn’t want it to take 7 hours. 5:40 is still a long time…. but it’s not an eternity. And it’s a 13:00 mile pace. The website also gives some “pacing information” which I found telling as well, and this is the part where I would like some advice from my fellow runner friends out there. The training paces tell me my “Easy Run pace” should be 14:00, which seems a little slow, my “Tempo Run pace” should be 11:40, which is pretty much what me and Rob are doing on Saturdays, maybe a little slower at 11:50 or so. Then it tells me my “Long Run pace” should be 14:00 – 15:30. I never run my long runs that slow, in fact 15:30 is walking pace. I know I’m a slow runner, but I don’t need to slow it down that much. 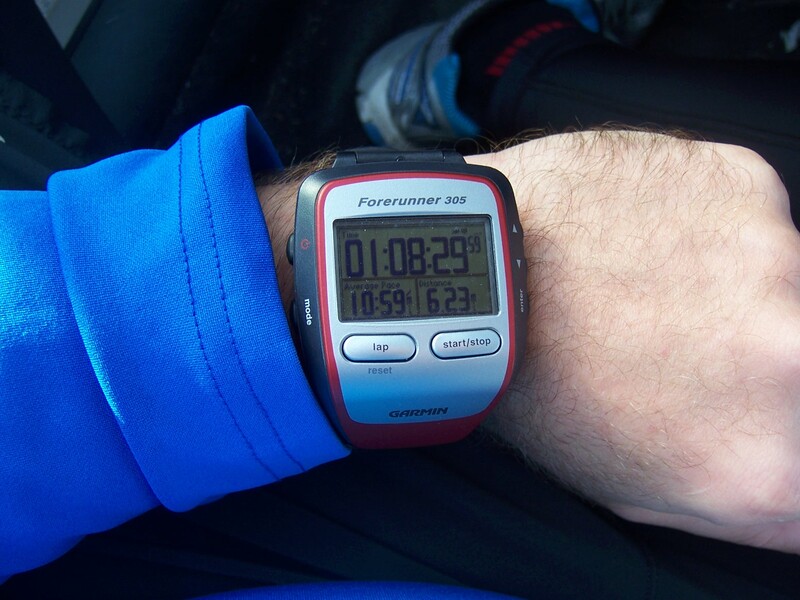 So here’s my question… Am I running my long runs too fast (12:30-13:00 pace)? I feel like if I run my long runs at a 15:o0 pace I’m gonna end up running my half marathon at a 15:00 pace, which is not gonna get the job done. I know I don’t have hit my target pace of 12:30 on my long runs, but I want to stay pretty close like 13:00-13:30. Should I slow it down, or should I continue to run what’s comfortable?